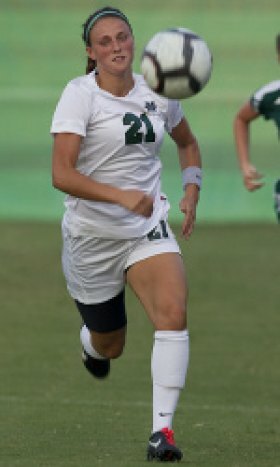 FARMVILLE, Va. -- An equalizing goal from senior forward Chelsey Maiden in the 31st minute of the Thundering Herd’s exhibition opener was not enough as Longwood defeated Marshall 2-1 Saturday night in women’s soccer action. Maiden’s goal was MU’s first shot on frame and leveled the match at 1-1 just eight minutes after the Lancers had taken the lead off the foot of midfielder Samantha Phillips. From there, the teams would duel toward a draw until freshman Bridget Bergquist netted the winning goal in the 71st minute. Bergquist scored the goal after slipping through Marshall’s back line and beating senior goalkeeper Lindsey Kerns one-on-one. Longwood sophomore Kelsey Lucas recorded the assist. Kerns, who logged the first 78 minutes in goal, made two saves while allowing both Longwood goals. Junior Caroline Harwell played the final 12 minutes in goal and saw three of the Lancers 10 shots. The Herd, which peppered the Lancer defense with 19 shots in a 6-2 pasting last year, was limited to just eight shots on Saturday. Maiden’s goal was one of only two that Marshall managed to put on frame – the other coming from Sarah Vinson minutes after Maiden’s strike. Marshall enters the final week of its preseason and will face Ball State Friday, August 17 at 3 p.m. at Huntington High School for the regular season opener.